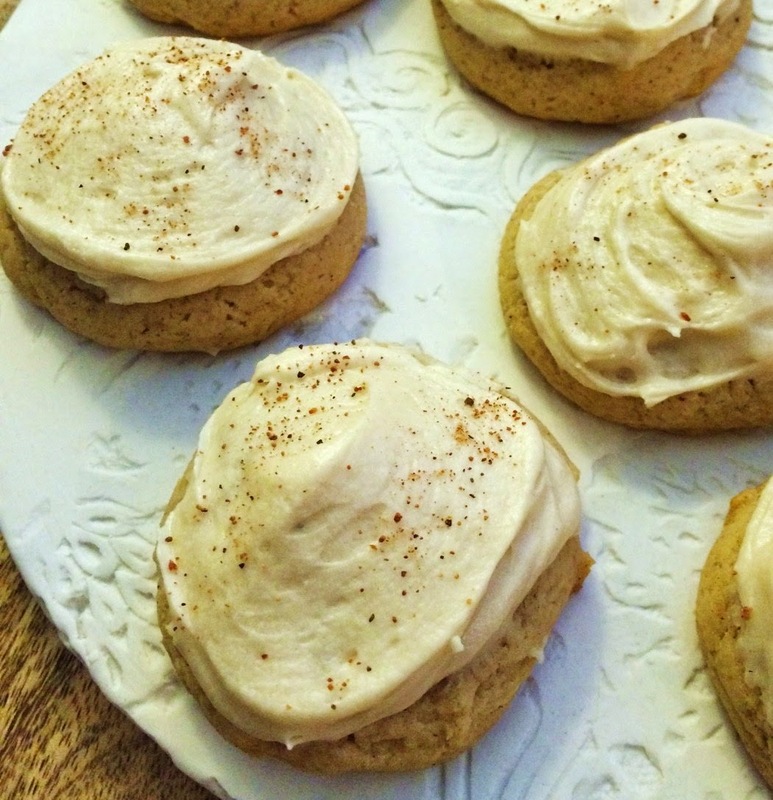 It's Christmas, so I can't think of a better recipe to share than these delicious eggnog cookies. They are sweet, soft, and melt in your mouth after each bite. I used maple extract in my recipe, but if you prefer rum extract, go ahead and try it. Happy holidays! In a medium bowl, mix together the flour, baking powder, salt, nutmeg, and cinnamon and set aside. In the bowl of an electric mixer with the paddle attachment, whip together the butter, sugar and brown sugar until pale and fluffy. Mix in the egg yolks one at a time, mixing until just combined. Mix in vanilla extract, maple extract and eggnog. With the mixer on low speed, add in dry ingredients a few batches at a time and mix until just combined. Drop heaping tablespoons of dough onto parchment lined baking sheets- space cookies about 2 inches apart. Once I dropped the dough onto the baking sheets I gently rolled the dough into round balls and pressed down slightly. Bake for 12-13 minutes. Cool on baking sheets several minutes before transferring to a wire rack to cool completely. For the frosting: In the bowl of an electric mixer with the paddle attachment, whip the butter until pale and fluffy. Add in the maple extract and eggnog and then the powdered sugar. You can add additional eggnog if you want to change the consistency and if you put in too much you can add a little more powdered sugar. 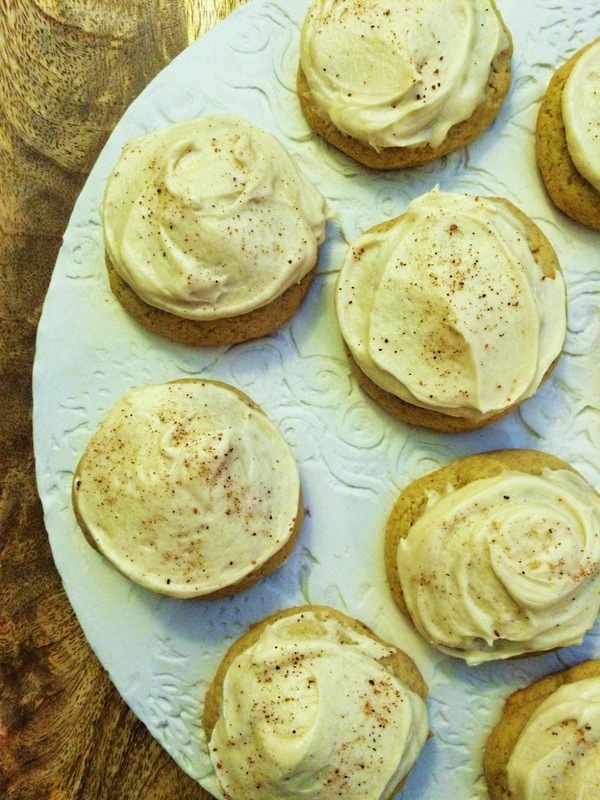 Using a spatula or knife, frost the cookies and then sprinkle with nutmeg. It's a new year with a fresh start. For the first time I've actually given my new year's resolutions real thought and wrote them down too...somehow they seem more real written down. I also looked up my last blog post and see that it was in May, and while I've said this before, I'm really going to make a serious effort to post more recipes this year. 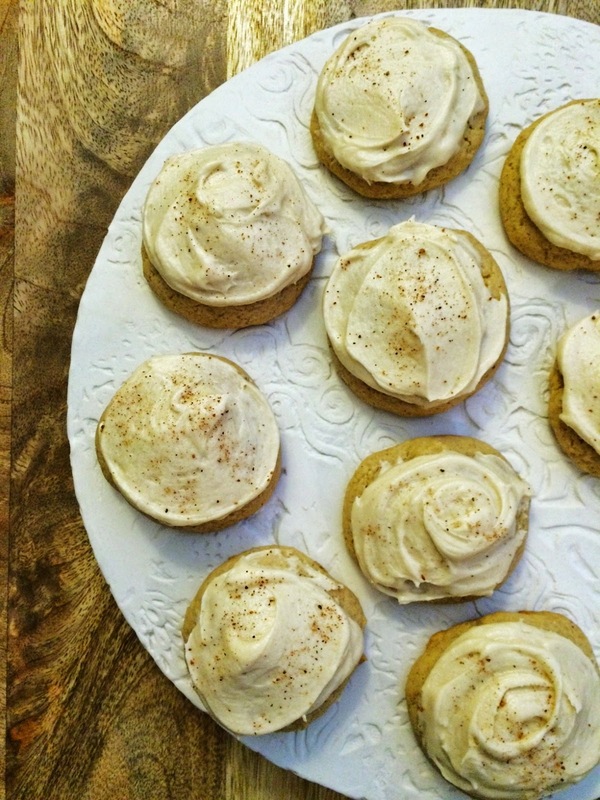 I know it's not fall anymore and you may be thinking why do I still have canned pumpkin in my pantry, but I've been wanting to make these Pumpkin Whoopie Pies since September and guess what...I finally did it! Better late than never. The cookie portion of these whoopies were perfectly moist and had just the right amount of pumpkin taste. The filling called for maple syrup, but I added in maple extract as well because I wanted a stronger maple taste. My taste testers agree this was a good addition, but if you don't like maple you could sub in vanilla extract. Preheat the oven to 350 degrees and line a baking sheet with parchment paper. In a medium bowl, whisk together the flour, ginger, cinnamon, baking powder, baking soda, and salt and set aside. In the bowl of an electric mixer fitted with the paddle attachment, mix the pumpkin puree, light brown sugar, dark brown sugar, canola oil, and eggs on medium speed for 3 minutes, until well combined. Scrape down the bowl and then turn the mixer on low speed. Slowly add the flour mixture to the wet ingredients, mixing for a total of 30 seconds, until the batter is just combined. Scrape down the bowl and make sure the batter is thoroughly mixed. Fill a pastry bag fitted with a large round tip, (the hole should be about the size of the tip of your ring finger) or use a ziploc bag and cut a hole in one of the corners, with the batter. Pipe the batter into 2-inch diameter circles onto the prepared baking sheet, leaving about 1 1/2-inches of space between each cookie. I also smoothed out any points on the cookies created by the pastry bag with a finger. Keep the batter refrigerated between batches. Bake for 10 minutes. Then rotate the baking sheet and bake for about 8 to 10 more minutes, until the cookies are a deep orange color and spring back when touched. Transfer them to a wire rack to cool completely before filling them. While the cookies are cooling it's time to make the filling. In the bowl of an electric mixer fitted with the paddle attachment, cream the cream cheese and butter together on medium speed for 3 minutes, until light and fluffy. Scrape down the bowl and add the maple syrup, maple extract, cinnamon, and salt. Mix on low speed for 30 seconds. With the mixer on low, slowly add the confectioners sugar and then beat for 1 minute. Scrape down the bowl and make sure the filling is thoroughly mixed. The filling should hold its shape; so if it is too soft, add more confectioners sugar a tablespoon at a time until the consistency is right. Once the cookies are completely cooled, turn half of the cookies bottom-side up. Place a drop of frosting on each bottom-side up cookie using a pastry bag or ziploc bag. Place the remaining cookies on top of the frosted ones and gently press down to sandwich them together.